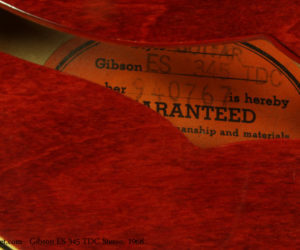 This example of the Gibson ES-345TD (the TD standing for Thinline body, Double pickups) is in good physical condition with no breaks, little scratching and one small chip at the top of the back of the head. It’s in good playing condition; it was professionally refretted and there isn’t a lot of wear on the frets. 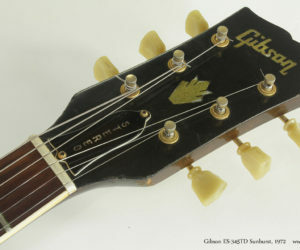 The ES-345 model with stereo and varitone was next to top of the line for Gibson thinlines – the next step was the ES-355, with the same general features but an ebony fingerboard, block position markers, more binding, and often a Bigsby or Maestro Vibrola. Whoa! This one has almost every available option – It’s a 2003 Gibson ES-345 Stereo with Varitone! Here’s a nice 1967 Gibson ES-345, with varitone; originally wired for stereo output, it’s been modified to a more practical mono setup. Finding a place in all musical genres, the ES-335, 345 and 355 have been popular since their introduction in 1958 and have never gone out of production. 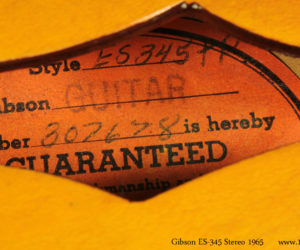 Here’s a great Gibson ES-345 Stereo from 1965. It’s got the factory Varitone switch too! 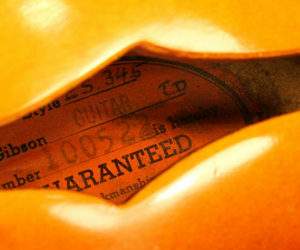 The full designation of this particular instrument is “ES-345 TD SV”. It’s an Electric Spanish, model 345, Thinline, Dual pickup, with Stereo and Varitone. 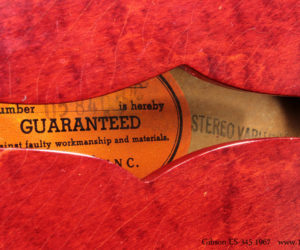 Close to the top of the Gibson semi-acoustic line, it’s easy to see from this example why these guitars were favoured by players who needed tone and playability along with a classic appearance. This guitar is in overall good condition.